Put in a large pan the butter and cook the chopped onion at low heat until soft. Around 15 minutes. Add the chopped garlic and cook for 3 minutes. Add the chopped carrot and cook 2 more minutes. Add to the pan the lentils, chopped tomatoes can, zest from half orange and flesh from half orange. Cook for 1 minute and add the vegetable stock. Cook at low heat for 20 minutes. Add the sugar in the last 5 minutes of cooking. Season. Transfer to a bowl and blend until smooth with a hand blender. Try and season again if required. You can serve with a bit of cream on top, fresh mint and some extra orange zest. Enjoy! This is so beautiful and seasonally appropriate . With our horrible weather and a the slew of articles I just read about how to use winter fruit + veg in new ways, you’re already ahead of the curve : D Gracias por esta! No hay de que! Enjoy it! This sounds really good! Do you use dry lentils or canned lentils in this recipe? I used dried ones, they are cooked in 20 minutes. Not much of a soup maker, but I like the combination oranges and tomatoes. And I like lentils … so maybe *smile – you photo is screaming at me. Like that track too. Are you getting some Irish veins ????? I love Pink Floyd and these guys from Trinity College are brilliant…they have a very good cover from Daft Punk. Absolutely love the sunburst effect of your soup. Recipe sounds heavenly, too. This looks amazing. I love the combination of ingredients and can’t wait to try the soup! They combine very well. Easy and healthy. Thanks. This just sounds sooo good, I’m visiting the post again tonight. I had always made an Indian style soup with red lentils but this Spanish version looks fantastic! 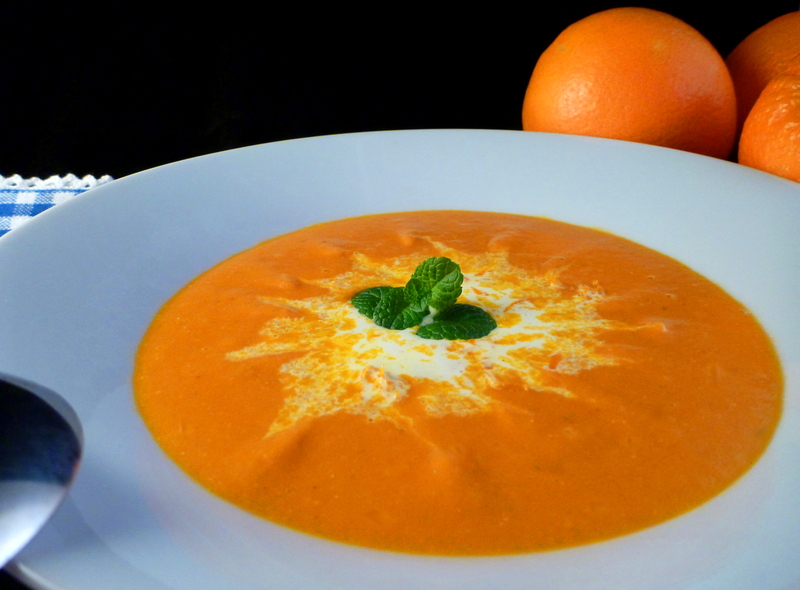 The tomato and oranges — mmmm, the color of the soup is gorgeous. Thanks. The orange gives an interesting kick to the soup. Thanks! Thank you! I make a Brazilian black bean soup with fresh orange juice and cinnamon that is so good. I’ll be trying yours this weekend! I’ve never heard of this combination in soup. I must try it! Brilliant presentation too. Thanks for posting this. It is a very easy one too. Enjoy it! This looks lovely, and easy to veganize! I will try it with oil instead of butter.